Despite my own love of kitchen time, I do not believe that every women should have to be a master chef. I mean, we leave in a magical age where food can arrive at your door. And not just pizza- everything. For two people who grew up in the country, outside the traditional delivery radius, James and I never cease to be amazed by this amazing perk of city existence. And yes, you can usually make healthier food at home… but not always. Plus, cooking takes time. I love that time, but I’m not about to force it on someone who has no time and just decides that this is one battle not worth fighting. But there are two things that every women (Or head of house, if that be a man, you can insert him for all uses of woman here. I tend to assume that my constituency is pretty pretty heavy on the high heels and scrunchies.) 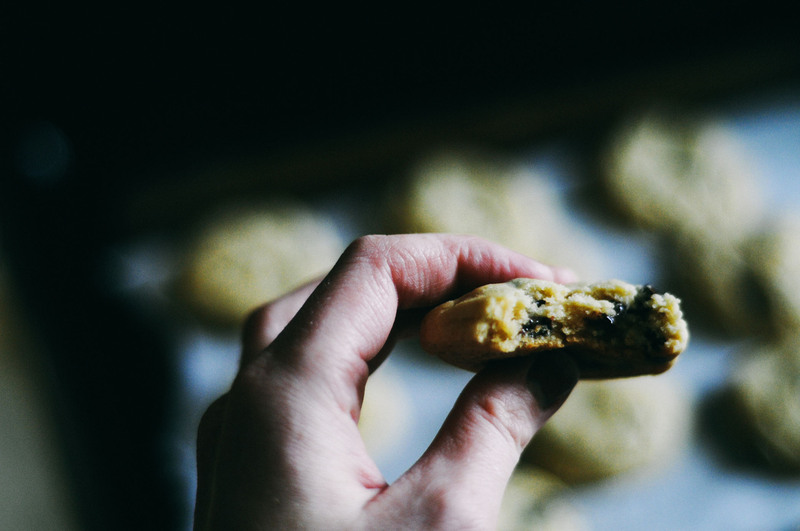 needs to master: a covered meal you can take to someone in need, and chocolate chip cookies. Both of these are hospitality staples, things that you role out to tell people you matter in my life. These are my mom’s chocolate chip cookies. She usually has a container of them frozen somewhere, ready to roll out when the troops roll in. They are the cookies that greeted me on the first day of school, the cookies that I remember making next to her when I still had to climb on a chair to reach the counter. They are the ones she sent me at college, the ones that I took James when we were dating, the ones that always taste like home. They are the cookies that are chocolate cookies to me. And they are absolutely, totally, ordinary. They have no nuts, no berries, no brown-butter or special toppings. I say best because I love them best, not because they actually are the best. They won’t surprise you, thrill you, or win any sort of culinary honor. But I would argue that that isn’t the point of chocolate chip cookies. These cookies will comfort you. They will disappear from the plate that you plunk down in the middle of game night or after dinner so fast that people will barely remember to comment on them. But later, when they leave, they will remember that they had been loved. That is what a chocolate chip cookie is supposed to do. I keep a bag of frozen dough balls on hand so that I can always have fresh baked cookies for the people who pass through our home. There have been a lot of those lately, some special visitors, but others are regular faces around our table and I love having these cookies on hand. I Instagramed a stack of them lately and had some friends ask for the recipe and I am excited to share it today. It is not terribly different from any cookie recipe, including the standard back-of-the-bag Tollhouse one (classic), other than the addition of cream of tartar and the adjusted baking time. I have flirted with other cookie recipes lately, tried them out and found them good. But you always come back to your cookies. And these are mine, the recipe my mother drilled into me adjusted slightly to reflect my own preference for brown sugar. I debated sharing “our” recipe, but I don’t really believe in unlimited secret recipes. You can, and perhaps should, have a couple – tops. After that, it’s important to remember the point of food, and that is building community. Letting someone recreate the joy they felt in your kitchen in their own is such a gift. 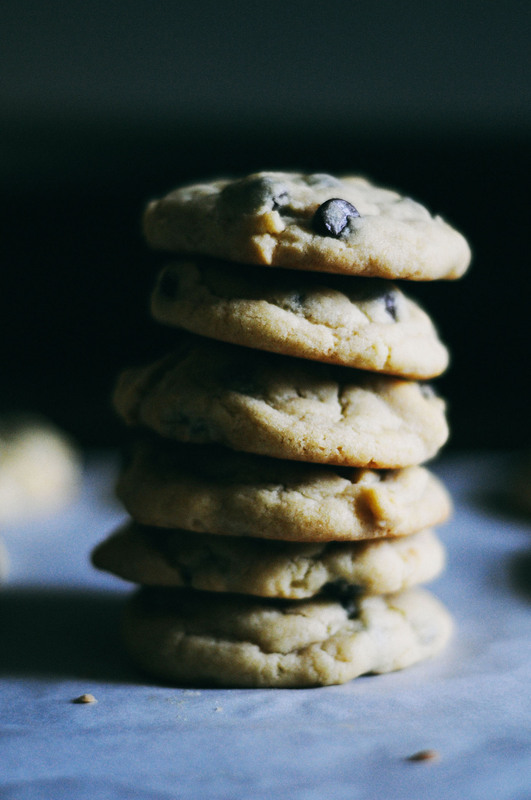 So if you don’t have a chocolate chip cookie recipe that is your own, the one that you go to, trust in, and are proud of, may I invite you to take this one. Beat until smooth. In theory, you should do the butter and sugars first and then add in the other stuff but I don’t think it makes much difference. Plus it makes more dishes and I am super opposed to any separate mixing. Once again, in theory this should be mixed first and added in batches… but that means more dishes. So I usually just dump in half the flour and the rest of the white stuff, stir, add rest of flour. 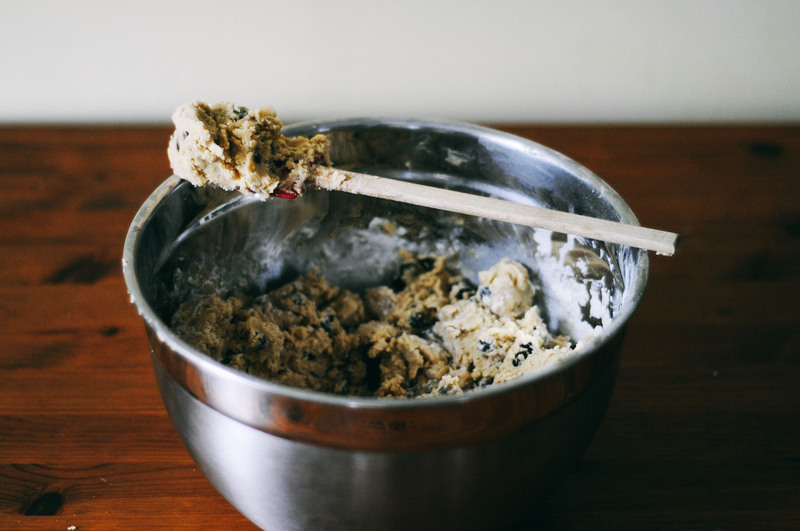 Throw the chocolate chips in with the last flour addition — for some reason that I do not understand this makes them better than adding them on their own. Form dough into balls and bake on ungreased (I line with parchment bc I’m lazy and hate dishes) cookie sheets at 350 for 10-11 minutes. THEN TAKE THEM OUT OF THE OVEN AND DO NOT TOUCH THEM FOR AT LEAST 10 MINUTES. DO NOT OVER BAKE THEM, EVEN THOUGH THEY WILL BE SUPER DOUGHY AND NOT COOKED. This is the real key. The hot cookie sheet finishes cooking them while keeping them fluffy soft. Add 1-2 minutes baking time if you start from frozen dough. This entry was posted in Uncategorized and tagged baking, cookies, photography. Bookmark the permalink. These truly are the best CCCs. They remind me of the freezer in your parents’ basement- a treasure chest of frozen cookies. FROZEN COOKIES FTW. And the days when you blithely threw back gluten..
One of my favorite cookie baking memories with you is first day of school senior year. We took tons of them to the freshmen in Olds. I think we were doing the Lord’s work that day. Totally. If cookies aren’t his work than what is??? You should. AND YES to partially raw cookies. It’s the only way to go. On the way home on the train tonight I was thinking I wanted to get busy in the kitchen tonight, and for once had everything I needed for some Friday night baking. They were the perfect start to the weekend, thank you! I’m so glad you liked them! 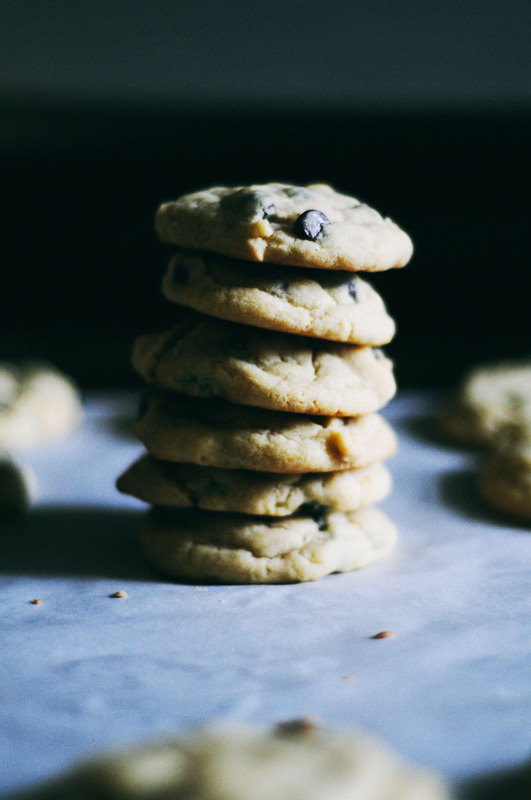 Cookies are the best way to start any weekend. Or end one. Or lead up to a weekend. Basically I love cookies. I love you’re view on cooking! I think it’s a great idea to have both a dessert and a meal you can pull together quickly to share. There is just nothing as wonderful as eating with the people you love! These cookies look amazing! I pinned them to my Edibles board on Pinterest. 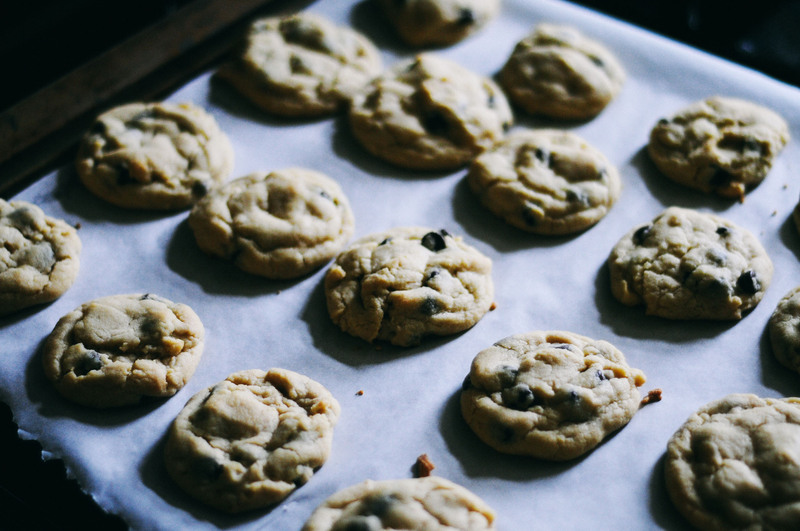 Ordinary chocolate chip cookies really are the best kind. Btw, I live in the DC area, too and I’m also a grad student (in English)! I started following “The Art in Life” a few months ago, and I love all of your tips/advice for the city. Love reading your blog! What kind of oil do you use? These look really good. I haven’t been happy with my recipe lately so I’m excited to try yours. I just use generic vegetable oil, but you could play around with coconut oil and it would probably be good! I’m a little bummed that I’m just now reading this! I have just arrived back at home after spending a week in Florida with my husband’s high school marching band. They marched in a parade at Disney World. I made over 100 chocolate chips cookies with a very carefully timed sharing moment to prevent crankiness before the late dinner stop on the drive down. It would have been the perfect time to try a new recipe! These sound delicious and I can’t wait to try them! Thank you so much for sharing! !